The Children's Books and Reading blog will keep you up-to-date with any new information added to the web site. Check below for the latest recommendations for inspirational children's books and new ideas and games to help your child become a successful reader. You can also subscribe to the RSS feed version of this blog and be updated automatically with any recent changes. Continue reading "How I learned to read"
The latest winners of the oldest and most prestigious awards for children's books - the Caldecott Award and the Newbery Medal - were announced on 2nd February 2015. The 2015 Caldecott Award was won by Dan Santat, the illustrator and writer of The Adventures of Beekle: The Unimaginary Friend. This is a picture book about friendship and courage. An imaginary friend, Beekle, is born on an island far away and waits to be chosen by a real child. Eventually, fed up with waiting, he heads off on a courageous and emotional journey to the city to find his own human. Read more here about previous winners of the Caldecott Award, including our all-time top favourites. 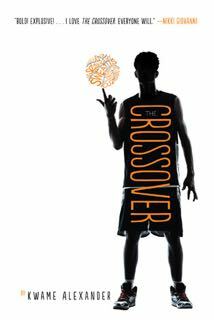 The Crossover by Kwame Alexander was the winner of the 2015 Newbery Medal. It is about two 12-year-old African American twin boys who are basketball stars, coached by their father, a former professional basketball player, and supported by their mother, the assistant-principal. When an attractive girl arrives on the scene, the brothers begin the painful process of moving apart for the first time. This novel, suitable for readers aged 11 and over, is written in verse with quirky vocabulary adding an amusing touch to the narrative. You can read more about the previous winners of the Newbery Medal here. Continue reading "Best Word Book Ever"
Can't think what to give your little ones for Christmas? I love to give books as presents to the special children in my life, and often I try to go one step further and pair a book or two with a similarly themed toy to create an educational book and toy gift combination. The toy helps to spark the child's interest in a new subject and then, when they are captivated enough to want to find out more, they can turn to the book to extend their knowledge. 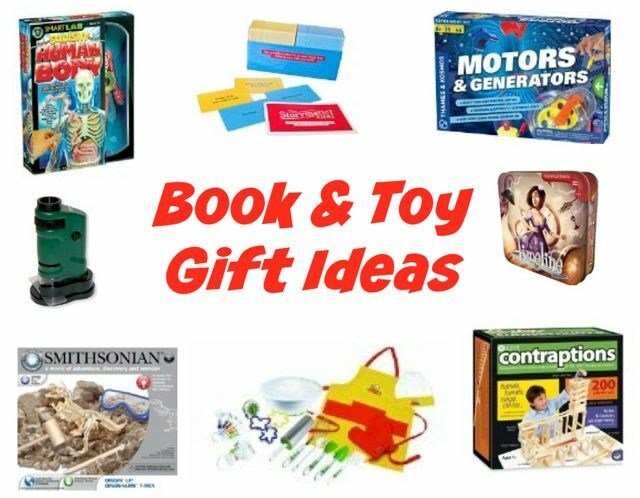 Here you can find some of my favourite book and toy gift ideas for children. In each case I have suggested two books in addition to a toy which perfectly compliments the book choices. Continue reading "Book and Toy Gift Ideas"
First awarded in 1922, the Newbery Medal was the first children’s book award in the world, and it continues to be one of the best known and most discussed children’s book awards. Reviewing past winners is a reliable way of finding inspirational and captivating novels suitable for young readers aged 8 and over. 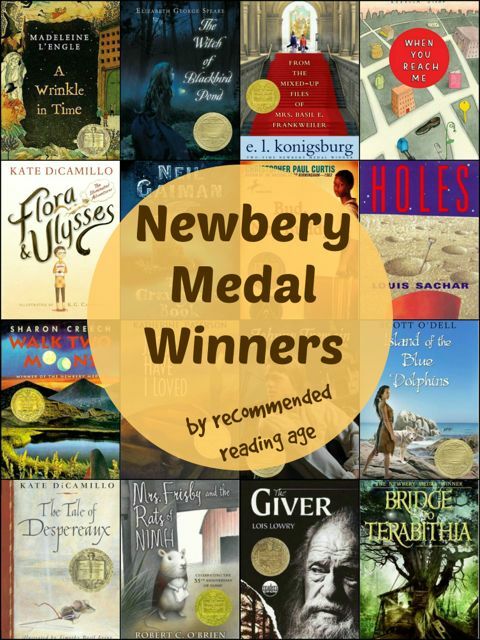 To help you choose just the right book for your child look no further than this full list of Newbery Medal Winners grouped by recommended reading age. You will even find recommendations for the very best of the best - those books considered by some to be most deserving of receiving this prestigious award. Continue reading "Newbery Medal Winners by Recommended Reading Age"
Are you looking for some fun, engaging and educational kids’ workbooks to help your child practice literacy skills such as reading, writing, vocabulary and spelling? 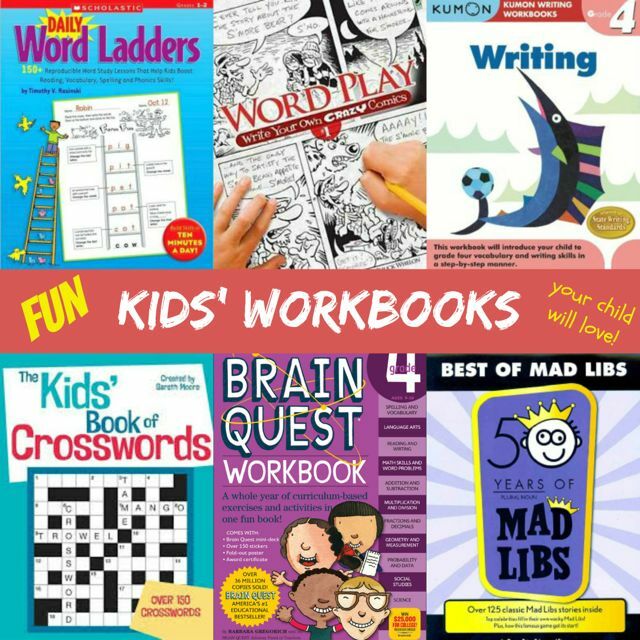 The trick is to find workbooks which practice literacy skills in a fun and appealing way so that your child is motivated to do them without too much fuss. Generally my children would rather play than complete written exercises (surprise, surprise) so I am always on the look out for engaging workbooks which help to disguise the work as play. Click to keep reading and find out more about our favorites. From comics to crosswords, silly stories to interesting comprehension exercises, you should find something here to engage your child. Continue reading "Fun Kids' Workbooks"
Do you have a bookshelf full of children’s picture books, many of which you never read? 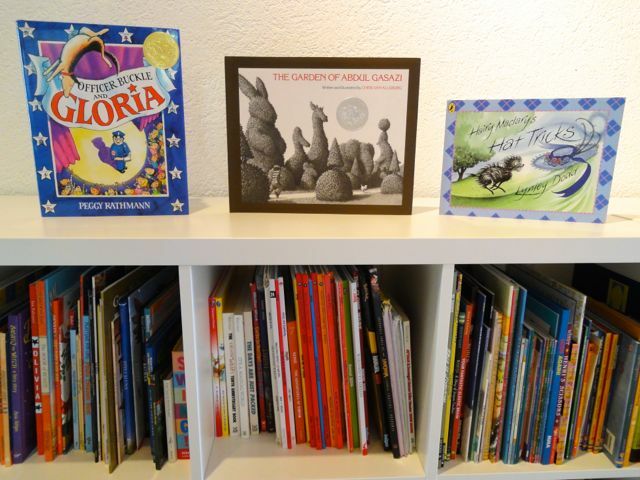 A great way of choosing different books to read is to think of a theme with your child and then choose three picture books from your bookshelf (or the library) which follow this theme and read those books together. For example, you could choose books which contain dogs or trains or nocturnal animals or monsters. My children are now reading chapter books and longer novels, but we still like to return to our library of picture books and read those regularly, and we love to use this way of deciding what to read. Continue reading "Reading Picture Books by Theme"
Have you got a plan yet for keeping your children reading throughout the long vacation? My summer reading challenge is simple. I have challenged my boys to read one book a week and write a book review for each book once they have completed it. If they achieve that, they will get quite a substantial monetary reward at the end of the holidays (enough to buy many, many thousands of Rainbow Loom bands - their latest craze!). Click to read more and download the templates we are using. 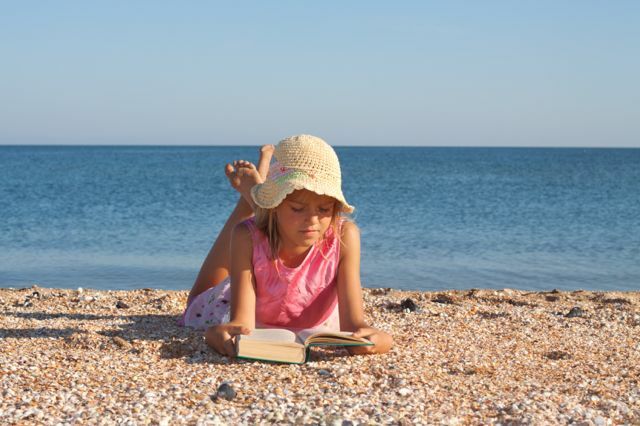 Continue reading "Summer Reading Challenge"
I am always trying to think of new, fun ways to encourage my children to get writing. Writing helps to develop literacy skills, such as vocabulary, grammar and spelling, as well as improving thinking and communication skills. Using technology in a creative writing activity is one way to engage your child. Anything to do with an iPad never fails to capture my boys' attention and there are some excellent apps available which your child can use to create their own e-books, comic strips or movies. However, I do worry that all the fun, creative tools that these apps provide can distract from the process of writing. The sheer versatility and potential of these apps can be a bit overwhelming for a 7-year-old (and, frankly, also for a 40-something-year-old!). There can be a tendency for your child to spend all their time tweaking the pictures or drawings, leaving little time for writing interesting prose to accompany the pictures. So I decided to use one of these apps in a structured creative writing activity which would allow my son to concentrate first on writing the words to accompany a comic strip, and afterwards on tweaking the pictures. Keep reading to see what I did. 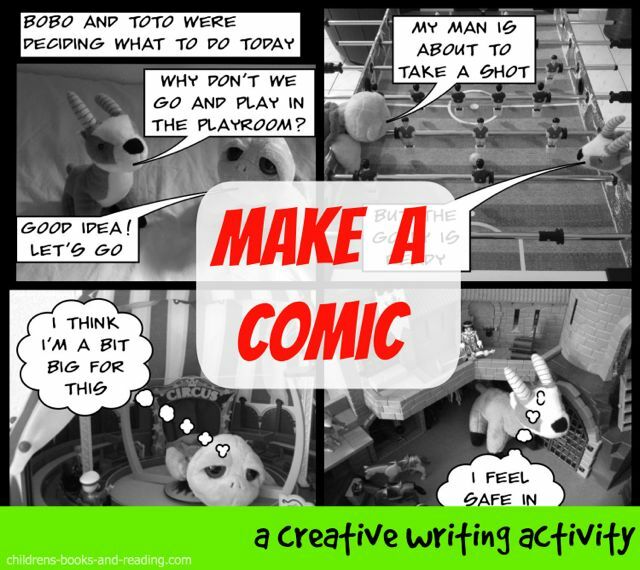 Continue reading "Creative Writing Activity: Make A Comic"
I have recently come across a great resource for helping my children to independently work out how to spell a word correctly while they are writing. As they work through the process of choosing the correct spelling for a particular word, they become more familiar with the different spelling patterns and so build on their spelling skills. The Vowel Sound Directory lists each of the different vowel sounds, grouping them into three categories: short vowels, long vowels and 'r' controlled vowels. Each vowel sound is listed on a separate page of this spiral bound flipbook together with all of its spelling alternatives and example words for each alternative spelling. 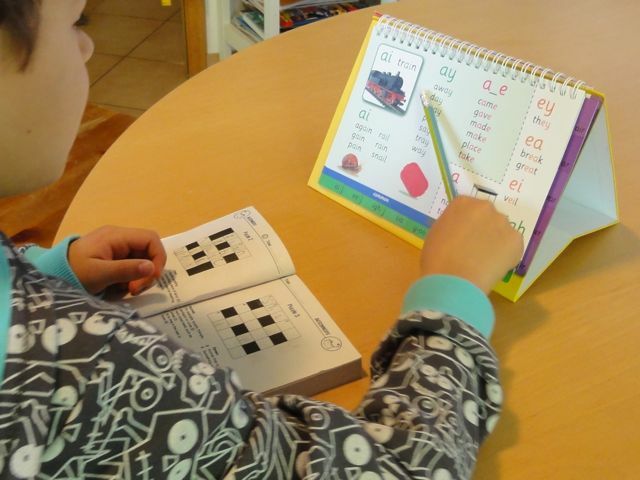 Read more about the Vowel Sound Directory and how to use it to encourage your child to think logically and independently about how to spell words correctly. Continue reading "Vowel Sound Directory"